Maggie attracts a lot of attention by doing little more than swishing her tail in the pasture. She's that good looking! 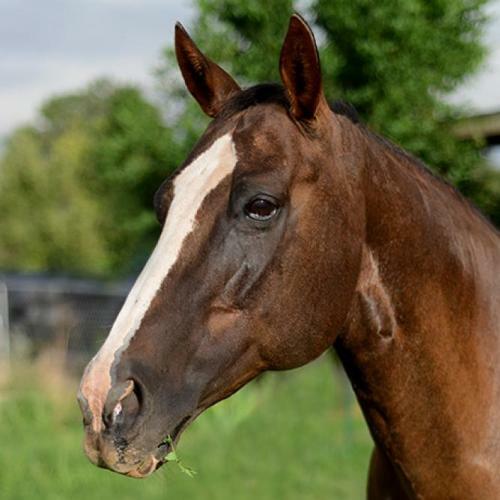 Born in 1994, she's a beautiful liver-chestnut Quarter Horse with a bit of experience under her girth. She was ridden in her private life, but due to her person's state of health, she received little attention during the years before she arrived at the Sanctuary. This mare is very curious and social, and will amble over to investigate anyone who pays a visit to her pasture. She also gets along wonderfully with other horses. Maggie thrives under her Parelli Natural Horsemanship training and is basically sound, but she's not in training under saddle. Maggie is primarily a Left-brain Introvert/Extrovert. A Level-3 Parelli student could use the knowledge of love, language and leadership to forge a lasting partnership with Maggie. Potential adopters who are proficient in other natural-horsemanship disciplines are also encouraged to apply for adoption by demonstrating their horse-handling skills. Please consider giving Maggie her dream of a loving, forever home.